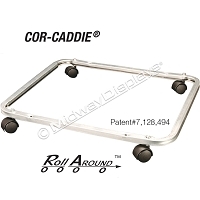 Our unique patented Cor-Caddie® puts your corrugated display on the MOVE, to be Front and Center where the retail action is, capturing all those retail promotional and time sensitive opportunity areas! An inconspicuous yet sturdy, square metal tube framed platform that quickly secures to your corrugated merchandiser creating an instant mobile display to maximize your brands visibility. It's strong, economical, and easily adapted to existing merchandising programs, providing your brand the ability to be flexible in any retail space to capitalize on peak selling times. Relocate your corrugated display to the entrance of the store to promote customer engagement, whether it’s bakery goods in the A.M., or beverages and snacks before the big game! Custom sized to fit your display, with snap-in casters in 40 or 75 pound weight strength. Locking Casters also available. Made in the USA!